The award-winning Axial-Flow 250 series combine features 2-speed electric shift ground drive transmission and optional AFS Harvest Command combine automation system. The ASABE, along with the Association of Equipment Manufacturers (AEM), praised all three products as top innovations among the AE50 honorees. ASABE, which annually distinguishes the 50 most significant product innovations in the areas of agricultural, food and biological systems, will present the inaugural Davidson Prize at Commodity Classic in Orlando, Florida. "While our efforts are always primarily focused on improving the efficiency and profitability of our customers, we appreciate this recognition of our commitment to that goal," said Scott Harris, Case IH vice president, NAFTA. "We're also pleased to note that all three products recognized by the AE50 awards this year were developed through our Customer Driven Product Design (CDPD) process. The process supports our High-Efficiency Farming initiative and has been instrumental in providing producers with award-winning agricultural innovations," said Harris. 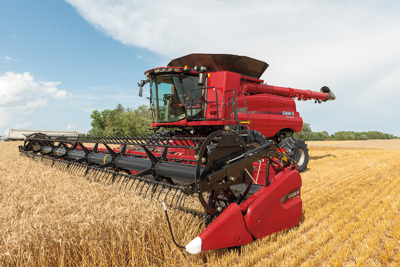 The Case IH Axial-Flow 250 series (Axial-Flow models 7250, 8250 and 9250) leads the industry in reliability and efficiency, with 2-speed electric shift ground drive transmission, adjustable rotor cage vanes and improved feeder house design. Choose from three levels of automation technology: Standard, Feedrate Control and Full Automation. The optional AFS Harvest Command combine automation system proactively senses and optimizes machine performance for maximum efficiency. AFS Soil Command sensor technology helps producers overcome unseen challenges to unlock a field's full agronomic potential during tillage and create the ideal seed growing environment. AFS Soil Command seedbed sensing technology allows precise measurement and optimization of the agronomic quality of the seedbed from the tractor cab, helping operators make yield-enhancing adjustments that reduce unevenness and uneven seed placement. AFS Soil Command agronomic control technology allows the operator to precisely coordinate control of every component of their tillage tool to optimize all machine settings as field conditions change. The Precision Disk 500DS air drill saves time and work, and reduces production costs by allowing operators to seed and fertilize simultaneously in one pass. The Precision Placement Knife optimally positions fertilizer to increase the accessibility to growing plants. Two ranks combined with 20-inch up-and-down movement of the parallel link row unit provide superior ground following, and lower weight means less compaction and more available horsepower to seed at higher rates.